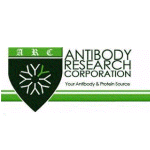 Antibody Research Corporation is a manufacturer of Antibodies, Proteins, Assay Kits and Reagents for laboratory research and development. We supply ready to use polyclonal and monoclonal antibodies, native and recombinant proteins, ELISA kits, biochemical assay kits and reagents for research. We also offer custom services for manufacture of these products. Currently we carry over 100,000 ready to use products listed on our online catalog. Our products are useful for research in cell culture, molecular biology, genomics, toxicology, microbiology, oncology, inflammation, infectious diseases, metabolic disease, etc.